This is a door hinge bushing repair kit for 70-81 camaro and trans am. 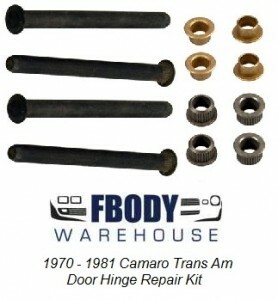 This is a door hinge bushing repair kit for 70-81 Camaro and trans am. Includes 4 over-sized bushings , 4 standard size bushings and 4 replacement pins. Bushings are over-sized and thus will be tight to get in, but this ensures they are not going to come out easily at all. Fix that sagging door before it damages the entire hinge!! 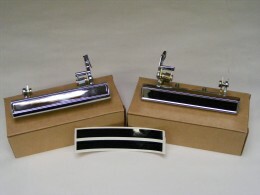 Standard bushings included too. Great assortment. We can also make it all over-sized or standard, just drop an email for your specific needs! Camaro Firebird Door Bushing Tool NEW!